For many ecologists, fieldwork involves majestic mountains or rushing rivers or large tracts of wilderness. At the very least, it means exploring natural areas that aren’t defined by human development. But for Carly Ziter, a research site can be a lot closer to home. In fact, it can be right out your back door. In a study published March 6 in the journal Ecosystem Applications, Ziter, a graduate student in integrative biology professor Monica Turner’s lab at the University of Wisconsin–Madison, finds that urban green spaces like backyards, city parks and golf courses contribute substantially to the ecological fabric of our cities — and the wider landscape — and they need to be added to the data ecologists currently use when exploring big questions about our natural world. To get a sense of how urban areas fit into bigger landscape dynamics, Ziter took soil samples from 100 sites around the city of Madison, Wisconsin. 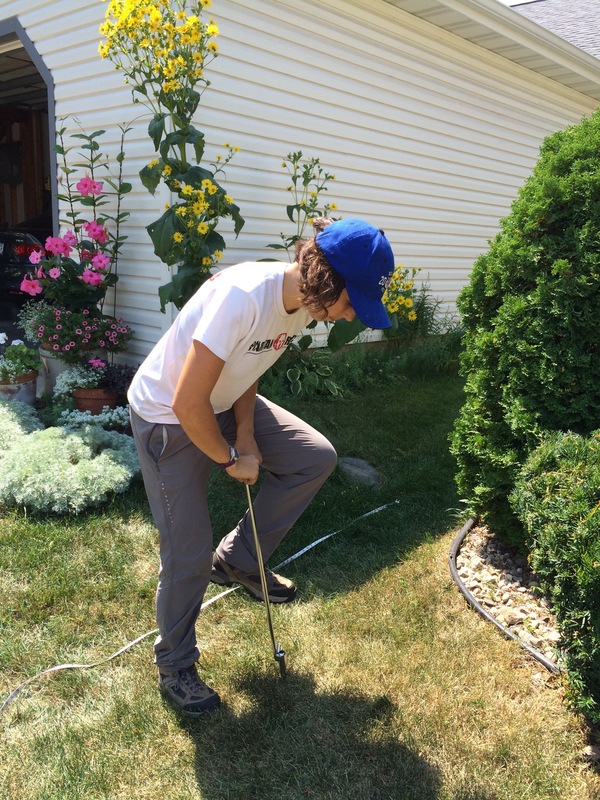 She surveyed cemeteries, the UW Arboretum, public parks — and lots and lots of backyards. Each sample was then analyzed for three ecosystem services: carbon storage, water quality regulation and flood mitigation. The results indicate that urban green spaces play a significant role in providing some ecosystem services. For example, Ziter found that more developed areas like public parks and people’s yards store substantially more carbon in their soils than urban forests or grasslands. Urban soils even stored more carbon on average than the agricultural soils that dominate Madison’s surrounding landscape. Despite this large carbon sink, many regional or even national assessments of carbon storage “count urban areas as zero,” Ziter says. Everywhere she looked in her research sites, Ziter found examples of ecosystem services. Urban forests and grasslands had a big impact on flood control, allowing water to infiltrate into the soil instead of simply running off into streets or storm sewers. And the kind and magnitude of service being provided varied from site to site. According to a 2016 report by the United States Census Bureau, more than 80 percent of Americans live in urban areas, which means that individual decisions can add up to big impacts on carbon storage, flood control or water quality — whether it’s planting turf grass or setting up a garden bed or putting in a driveway. “If you’re out gardening, you’re interacting with the natural world. If you’re going out for a walk along the lake, you’re interacting with the natural world. We often think of nature as being in these big wild spaces, but there are a lot of smaller day-to-day interactions that we don’t realize are fostering a connection to our environment,” Ziter says. And these interactions promote physical health, mental well-being and overall quality of life in a city, she adds. Ziter hopes her study can help highlight the importance of urban green spaces and encourage more ecologists to start studying these urban environments. However, she cautions, the job may not be for everyone. This story originally appeared at news.wisc.edu. This work was supported in part by the National Science Foundation Long-term Ecological Research (grant DEB-1440297) and Water, Sustainability and Climate (grant DEB-1038759) programs, the University of Wisconsin–Madison Vilas Trust, the Natural Science and Engineering Research Council of Canada doctoral fellowship, and a PEO Scholar Award.